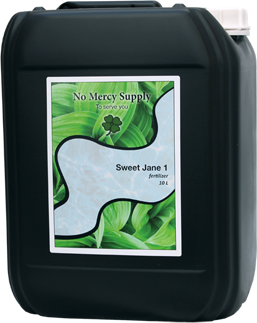 Sweet Jane 1 and 2 are developed to the nutritional needs of the crop. Because the nutritional needs during flowering, fruiting and ripening are not equal, we have developed a fertilizer that keeps very good account to the needs of the crop at the different stages. Because of this the crops will lack nothing, but there remain no nutrients in the soil that can cause accumulations and thereby can cause blockages. The trace elements in the mineral part are chelate bound. The iron is bound to the Fe-EDDHA chelate, allowing the incorporation of iron even with PH abnormalities. for the remainder of the cycle. Sweet Jane 1 and 2 can be mixed during the transition week for a smooth transition. Using Grow Sensation during the vegetative period and Bloom Sensation during flowering/fruiting will lead to even better results, but is not mandatory. With using only Sweet Jane very good results are already achievable. 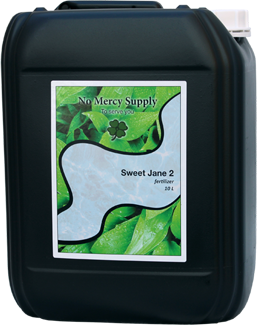 The recommended dosage for Sweet Jane 1 and 2 is maximum 10 milliliters of Sweet Jane into 2 liters of water for mature plants. It can be given every time. For plants smaller than 30cm (12 inch) use half the dosage. The use of an EC meter when creating a fertilizer solution is preferred.